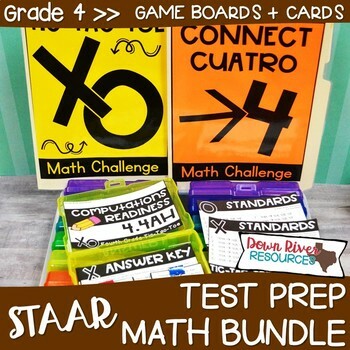 This fourth grade STAAR test prep resource includes the two fun and engaging game boards for students to use along with a multitude of unique rigorous questions. Ditch the multiple choice practice + make test prep fun for your mathematicians! Your students will love playing these fast-paced games! This bundle currently includes cards to practice how to represent number values; represent fractions to decimals; solve measurement problems; compare two fractions; represent and solve addition and subtraction fractions; add and subtract whole numbers and decimals; and solve one- and two-step multiplication and division problems. ☑ I have taken the guess work out for you! This resource has the directions and answer keys for each game. ☑ all students can participate. You can use your classroom technology to display it for the class. Students can work in partners or teams to generate responses! 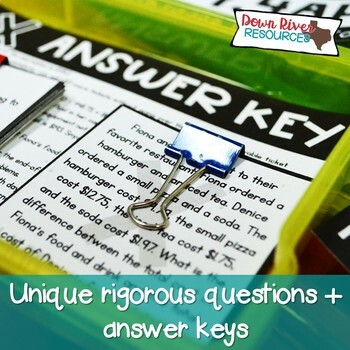 ☑ The question cards in this set are rigorous for reviewing the fourth grade math TEKS. ☑ The review games provide a “brain break” during test prep sessions. 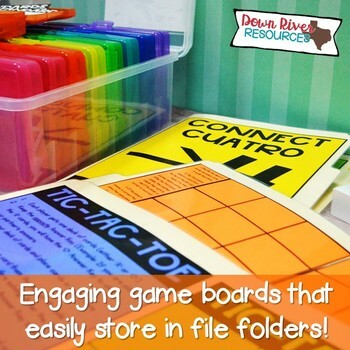 Use them in between activities for a purposeful game! 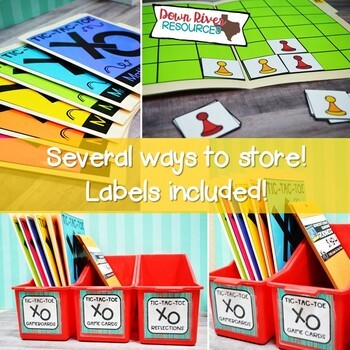 ★ Organization & Storage Labels for Iris Photo Boxes, Catalog Envelopes, and Sterilte ClearView Drawers, etc. ★ ALL of the pre-made game card sets each include a label, standards for each specific question, 24 game cards, and answer key. The value of this bundle is $62.00. ★ Due to the nature of the game cards I created, I will NOT be able to create cards for every strand. The size of the cards do not allow for example of graphs, etc. I have math test prep resources for third, fourth, and fifth grades. 1. There is an EDITABLE game card template included in this bundle. 2. Please download the preview for a closer look at this resource. 3. This is a .zip file. Please know how to download before purchasing. 5. File last updated on May 2, 2018. Here’s to you for making a splash and checking out this diverse, rigorous resource! For FREE tips + resources, become a valued partner of Down River Resources. © Down River Resources 2018. Single classroom use only. For use in multiple classrooms, please purchase additional licenses at a discounted price.